The city, named Hanyang, became the capital not only of the Joseon Dynasty (1392-1863) but of its short-lived successor, the Daehan Empire (1863-1910.) 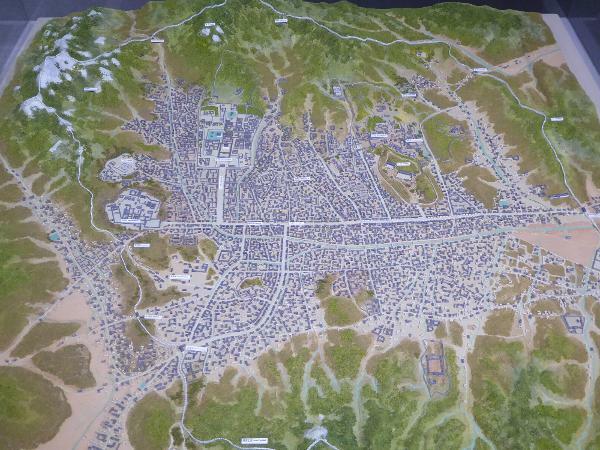 The Japanese, during their brief rule in the 20th century, renamed the city Kyongsong, but as soon as they left the Koreans renamed it once again, this time as Seoul, or Capital. 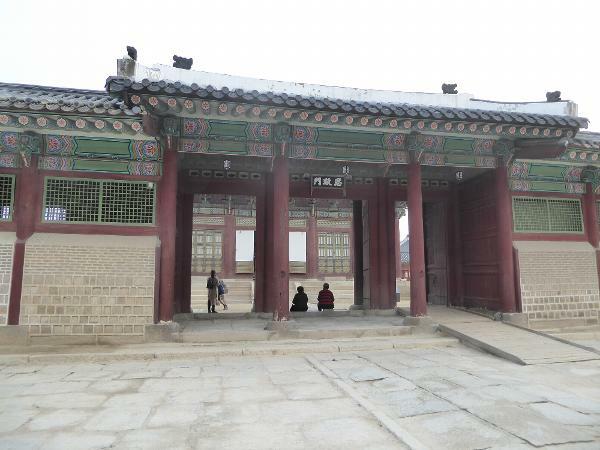 Here we look at three of the most important royal palaces of Hanyang-Kyongsong-Seoul, along with a royal garden that was more than a pleasant retreat and at a shrine holding the royal spirit tablets. 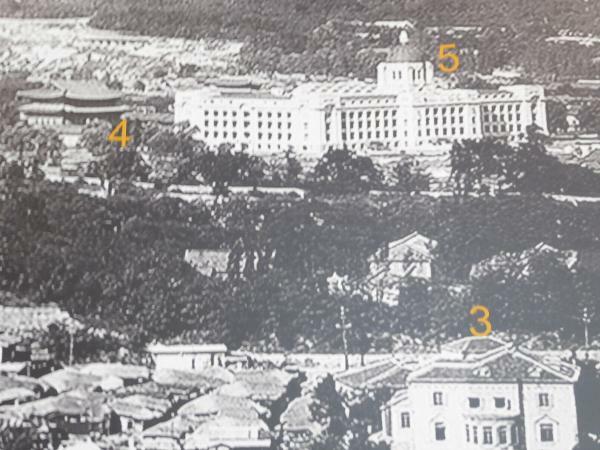 A historical map in the Dongdaemun History Museum shows the gate itself (on the far right here), the line of the city wall, the great east-west avenue (Jong-ro), and the north-south axis that is now Sejong-daero. 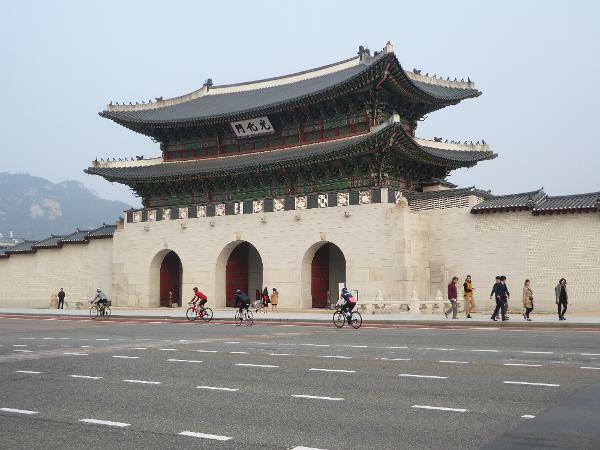 That street leads north to the Gyeongbokgung or Gyeongbok Palace, the "Palace Greatly Blessed by Heaven." 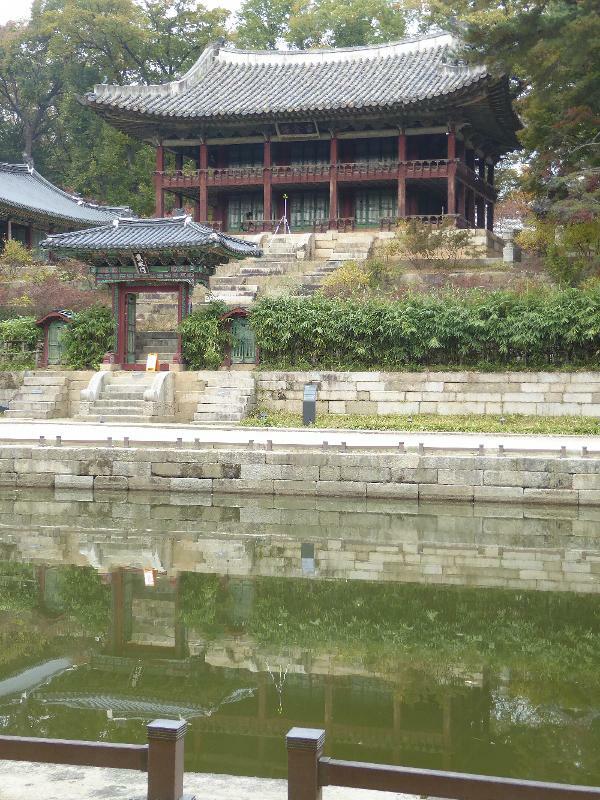 To its east lies a recently publicized neighborhood of traditional housing (hanok), once the residence of officials and now an cultural-heritage attraction. 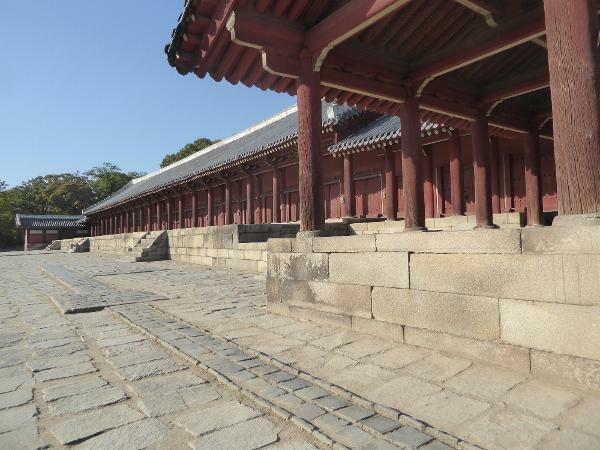 Farther east is the enclosure of the Jongmyo Shrine, holding royal spirit tablets. 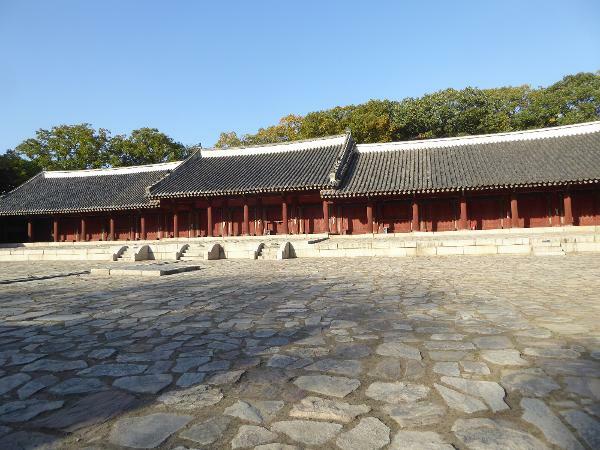 Just to its north there's a cluster of other royal palaces, chiefly Changdeokgung, the "Prospering Virtue Palace." 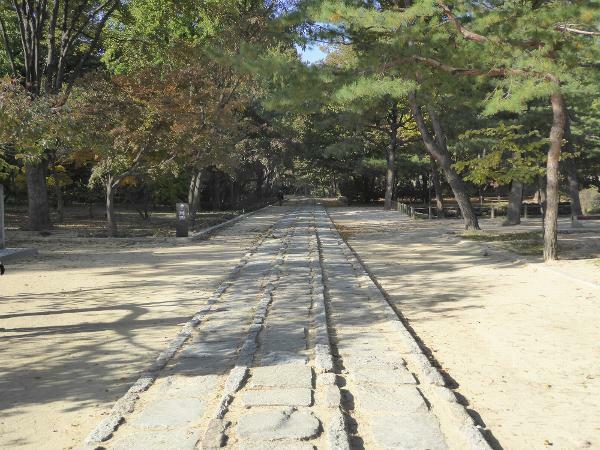 A main road, not shown here, now runs east from the entrance of Gyeongbok Palace and separates the eastern palaces from the tablet shrine to their south. Think it's just engineering? 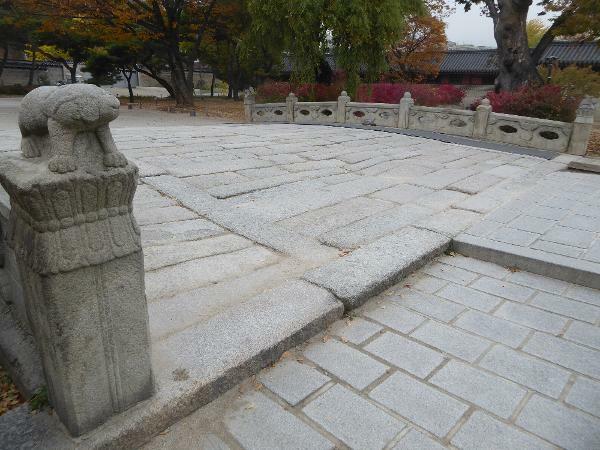 Hae Un Rii, a geographer at Dongguk University, writes that "the Japanese opened up the new road between the palaces in order to break the geomantic basis of the area's planning and block the traditional spirits (gi) which, according to Korean geomantic notions, flowed from Bukak (North Mountain), toward the south." See her "Seoul, Republic of Korea: Removing the Reminders of Colonialism," in William S. Logan, ed., The Disappearing 'Asian' City , 2002, p. 83. 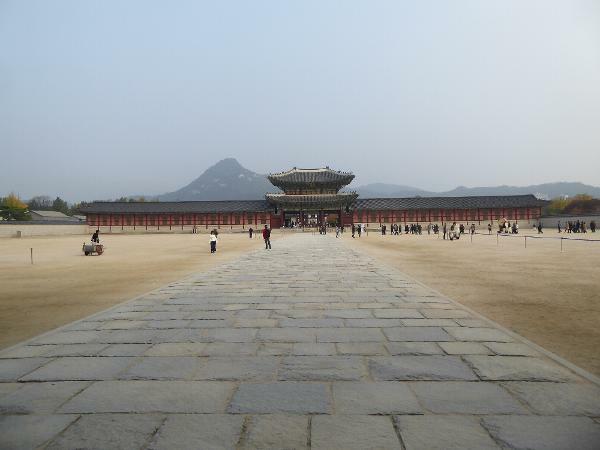 Here's the western end of that street, Yulgok-ro, at the north end of Gwanghwamun Plaza. 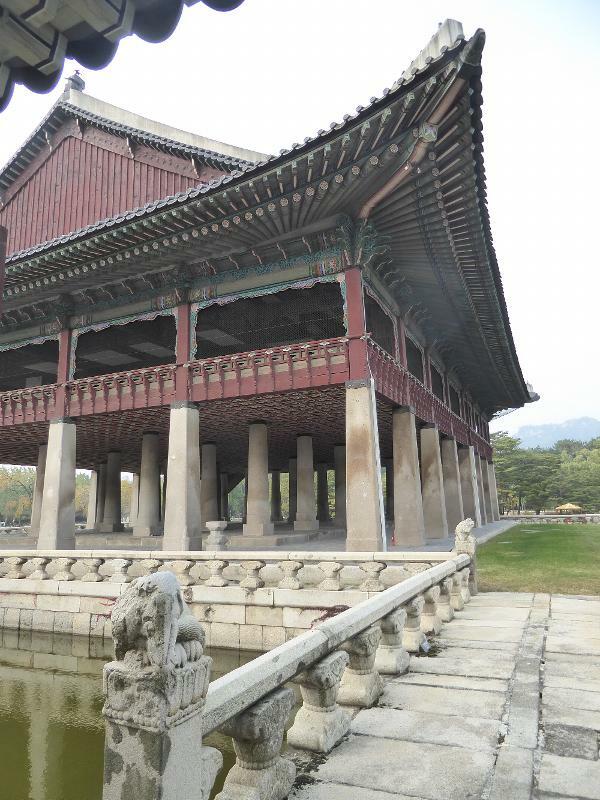 The structure here is Gwanghwamun itself, the south-facing and therefore the most important of the four main gates around the Gyeongbokgung. 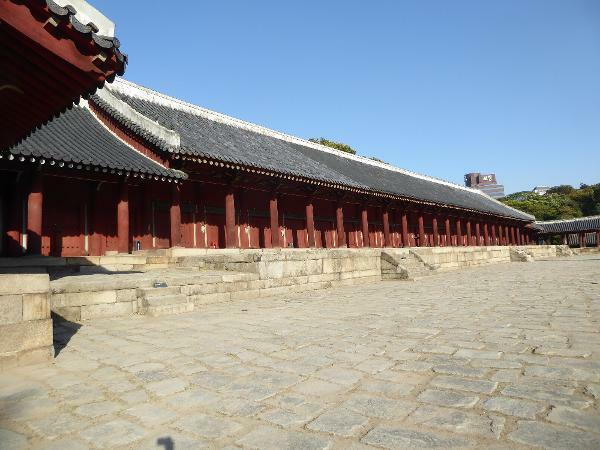 Begun in 1395 as the first palace of the Joseon Dynasty, the palace was destroyed by the Japanese 25 years later and not rebuilt until 1865. The gate has been rebuilt again since then, in 1960. It should be and once was on a platform. It's not, because the Japanese built the road at this raised level, and it's never been changed. Call it a going-away present. 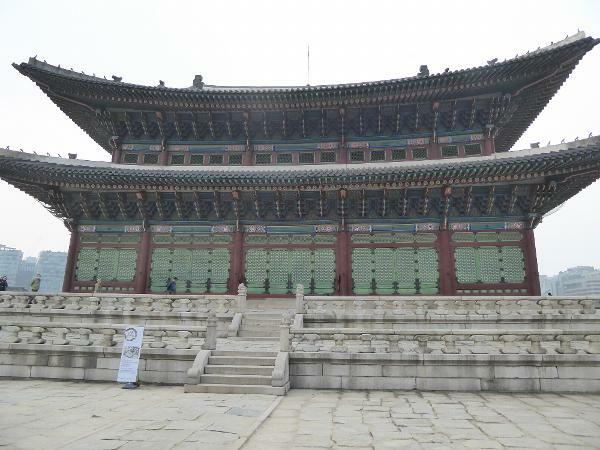 Gyeongbokgung (sometimes translated as the "Palace of Shining Happiness") is the most orthogonal of Seoul's palaces. 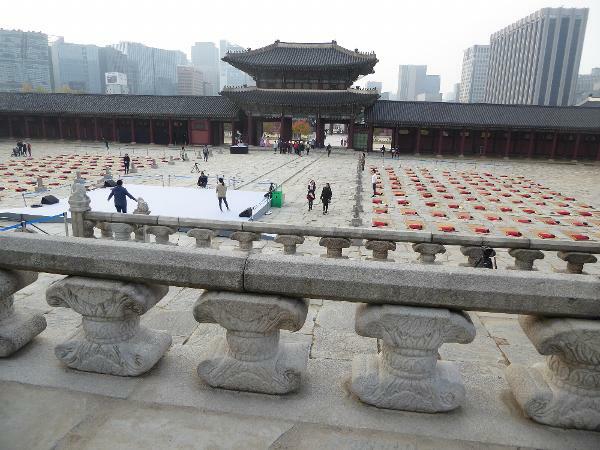 Like its Chinese models, it is compulsively, oppressively, overbearingly symmetrical and, uniquely among Seoul's major palaces, cardinally oriented. The eyes and nose of the dragon (or white tiger) on Mt. Gaetak gaze protectively over the premises. Heungnyemun is the gate where we get tickets. Don't ask me why, but you have to buy tickets for Westminster Abbey, too, and the Taj Mahal. Straight ahead, and in the center of the staircase, a spirit slab hints at the solemnity of the enclosure. No time to think about that. Just reach into your wallet like a good tourist. Here's that central spirit staircase, with protective haet'ae, modified lions with keen powers of discernment. There are so many comparable elements in other Asian architectures. Think of the moonstones of Sri Lanka. 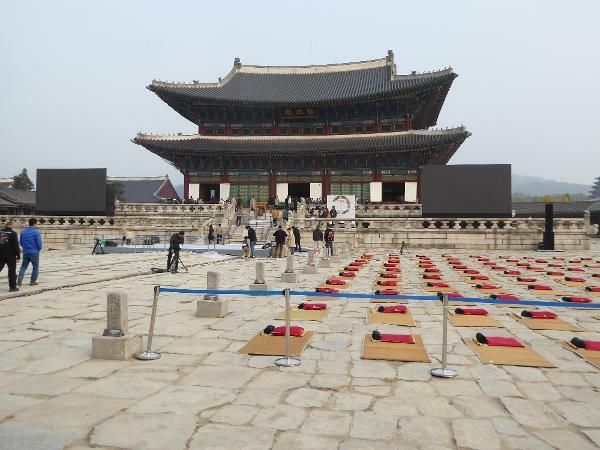 People are getting ready for a television production here in the courtyard in front of the throne hall, the Geunjeongjeon or Kunjong-mun. (Welcome to the delights of Korean transliteration.) Stone rank markers once told officials where to stand, highest to lowest; mats have been placed for today's occasion. Sorry; we're not going to stick around. Another spirit staircase. 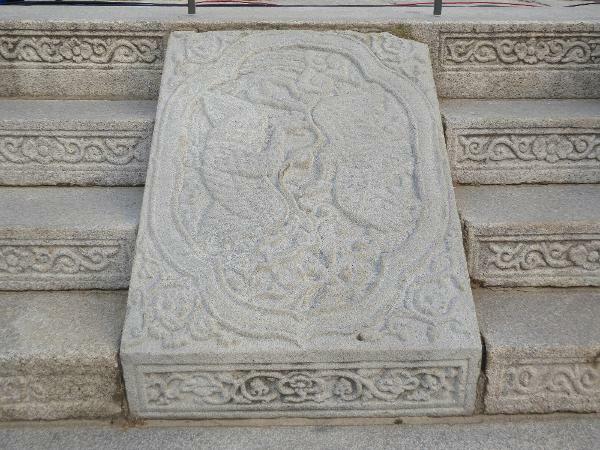 The Chinese version, as for example in the Ming tombs, often pair a phoenix with a dragon as symbols of empress and emperor. 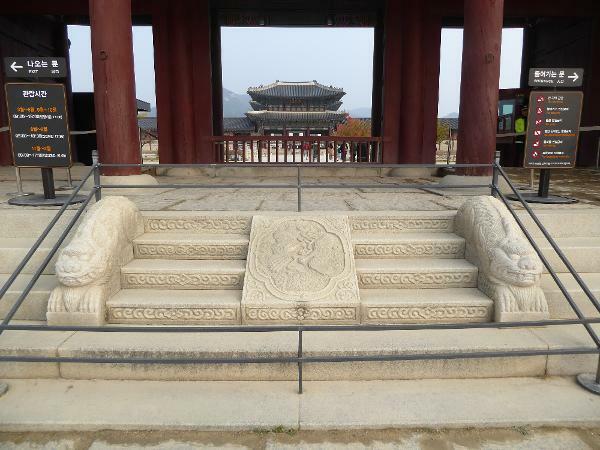 Here, the slab is two phoenixes, according to some symbolizing the king and the highest official. View from the platform back along the central axis. The balustrate supports look like bound and crushed sheaves of grain. Interior of the throne room. Behind the throne is a sun-moon screen with the five peaks that are, or were, the home of protective spirits. The room seen from the side to show bracketing. 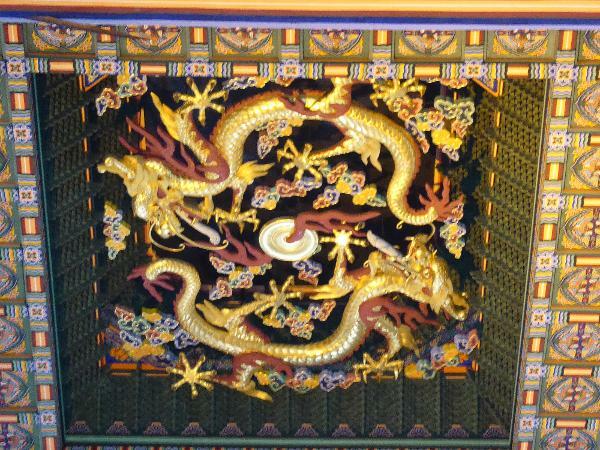 Up top, clouds and dragons circle the throne. The throne hall seen from the north side. The axis continues farther north to another gate, beyond which lies another hall, Sajong-jon. Here it is: no walls, just doors and windows. The name was given by a Confucian scholar, Chong Do-jon (1337-1398), and implies a place devoted to principled thought in managing state affairs. The name of the throne room, in contrast, suggests diligent effort in managing those affairs. Planning and execution, in other words. 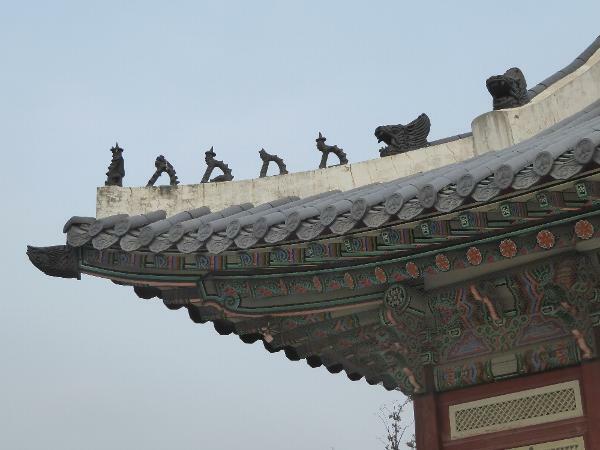 You may have noticed the stylized figures near the ends of the roof ridges. They have a name, of course: chapsang. What they signify isn't so clear: one theory is that they represent a pilgrim (Hsi-yu Chi) and the animals accompanying him in a journey to India as described in Journey to the West, a 16th century Chinese novel. 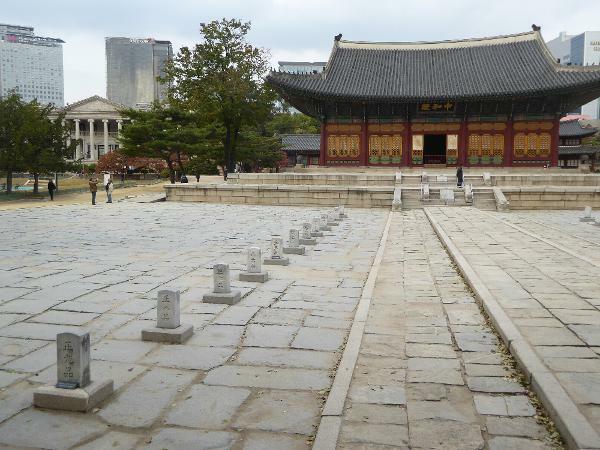 Off to one side: Kyonghwe-ru, a banquet hall and more, because each of the 48 columns is marked with the name of one of the 24 Korean seasons, arranged in calendrical order. The structure was rebuilt in 1867, and the columns are simplified replacements. 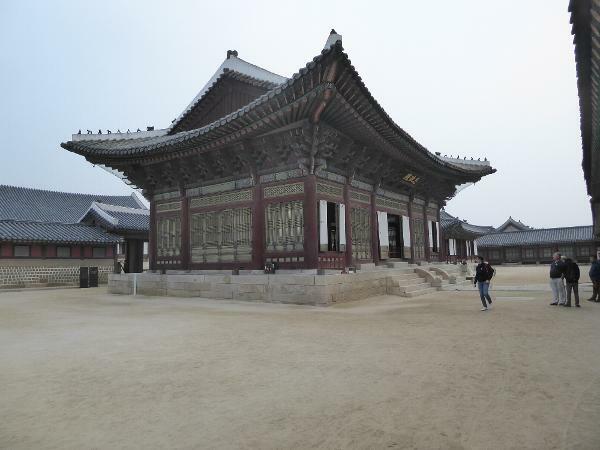 The Japanese put their Korean headquarters smack on the palace axis and right in front of the throne hall. How's that for wicked? George de Lalande, a German architect despite his name, began the building's design but died, leaving the work to be completed by Ichiro Nomura, a professor of architecture at Tokyo University. Granite faced, the building was of reinforced concrete. 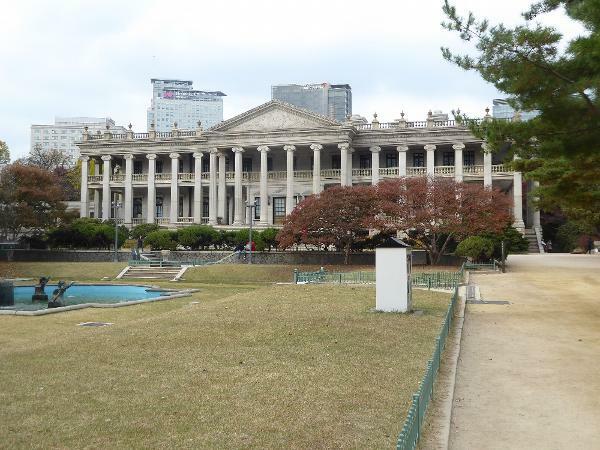 After 1945, it served briefly as American headquarters, as the South Korean government's headquarters, and for a decade as the national museum. Fifty years after the Japanese departure, the building was demolished. A few of the capitals survive in the Tokyo history museum. We've moved east a few hundred years to a bridge, Kumch'on-gyo, built in 1411 and far older than anything else we've seen. 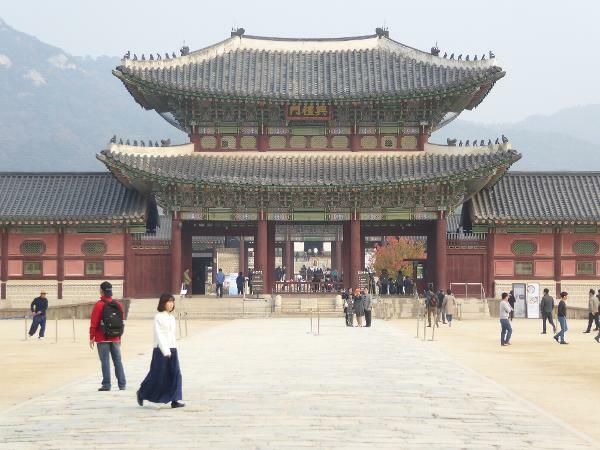 It leads to the Changdok Palace or the Changdeokgung, which for most of the Joseon Dynasty served as the functioning capital while the Gyeongbokgung lay in ruins. Curiously, this palace is not cardinally oriented and aligned in a single direction. 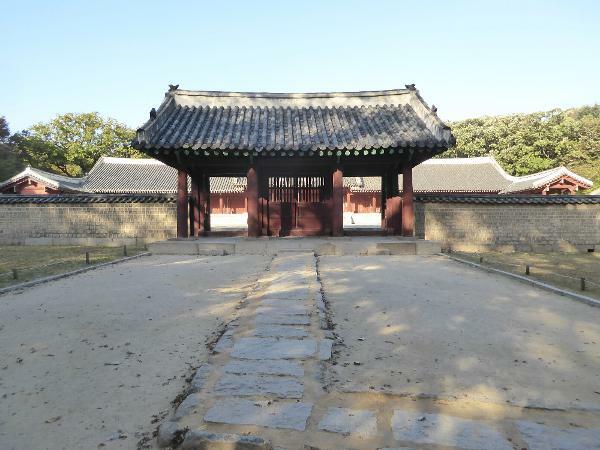 Instead, the approach lies on an axis perpendicular to the line from the final gate, Injong-mun (here on the right) to the throne room, Injong-jon, behind it. Here's that throne room, complete with markers indicating the nine ranks of officialdom. The hall, built in the early 1400s, was destroyed by the Japanese in the 1590s. Rebuilt, it was then used as the seat of government until 1910, except when being rebuilt after periodic fires. These fires continued into the 20th century, when a fire in 1903 forced another rebuilding the next year. The double roof is deceptive: there's only one floor. The hall has glass windows and electric lights. Some things didn't change at the last rebuilding, however: behind the throne, for example, is the customary sun-moon screen with five mountains. The hardest part of recent reconstructions may have been finding Korean pine logs 46 feet long with a minimum diameter of 21 inches. 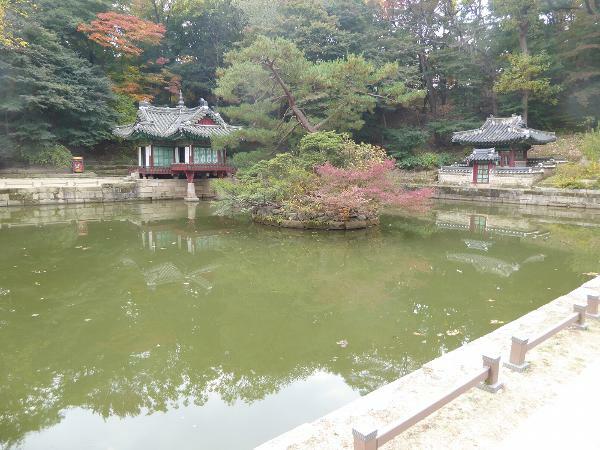 Behind the palace lies the so-called Secret Garden with the Puyong-ji Pond. The square shape and round island may seem no more than a design choice, but the island represents the heavens, and the square frame represents the earth. The meaning is that, charged with universal energy, the earth is embedded in the cosmos. 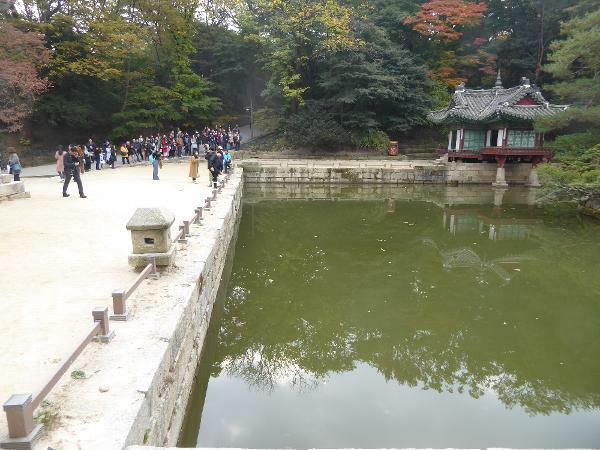 Overlooking the pond are the Osu-mun Gate and, on the hill behind it, a building of two floors. The lower housed a precious library and document room; the upper, a banquet hall combined with a gallery of royal portraits. Completed in 1777, the building and its setting became a kind of academy of scholarship and character development for promising young officials. The name "Secret Garden" is a misnomer. Meanwhile, the 19th century kings began living increasingly Europeanized lives, partly of necessity and partly from exposure to new styles. 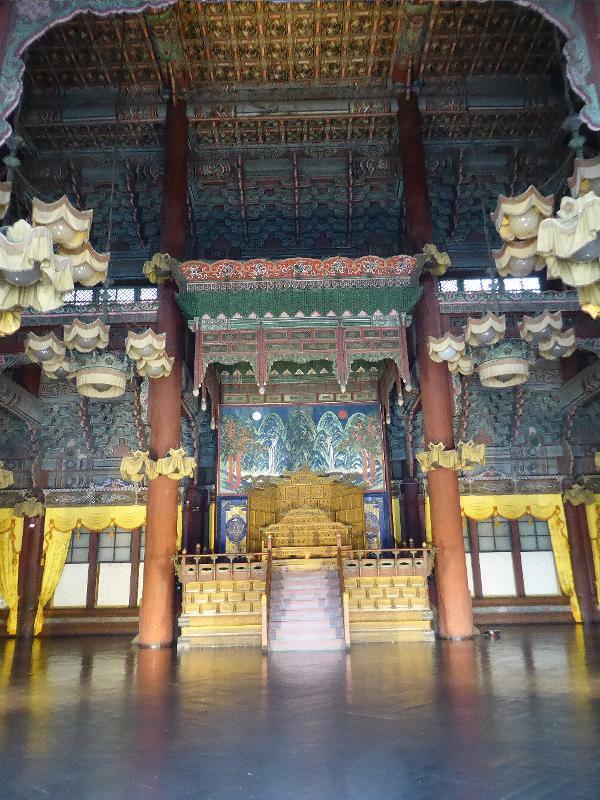 Here, close to the throne room, is part of the crown prince's residence: the hexagonal room is the Samsam-wa Pavilion. 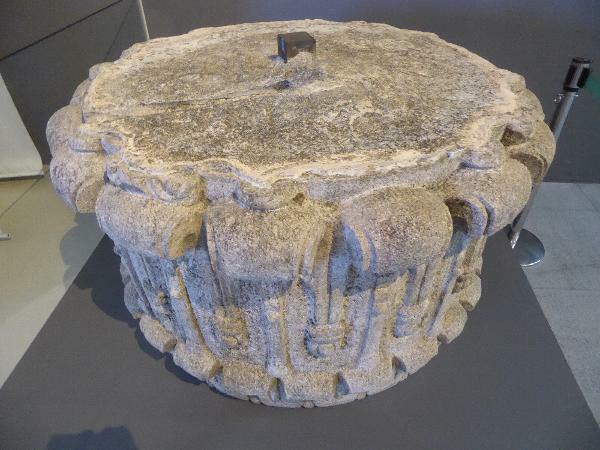 Furniture of a sort unknown to earlier centuries. 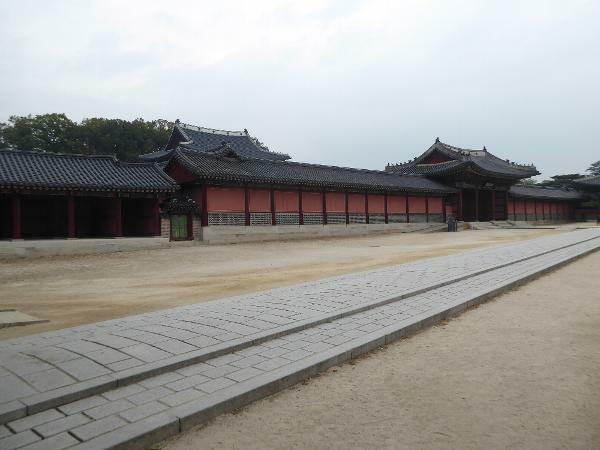 A mile to the south, Deoksugung Palace was built for a brother of a king but became the royal residence for a short time after 1600. 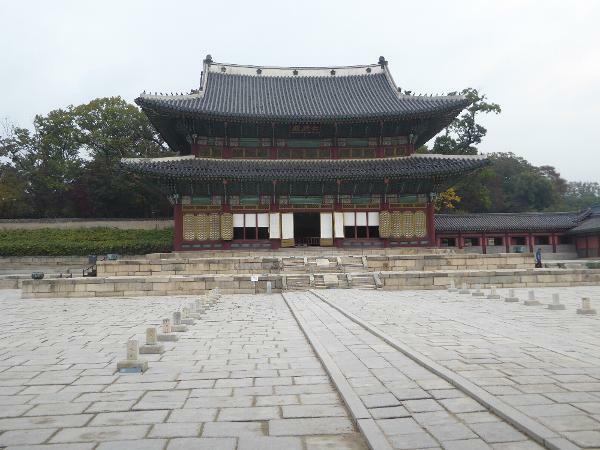 With the opening of Changeokkung, Deoksugung became a subsidiary palace for 170 years until, in 1897, Kojong moved here. By then, the tide of westernization was so powerful that he commissioned the hall seen here on the left. 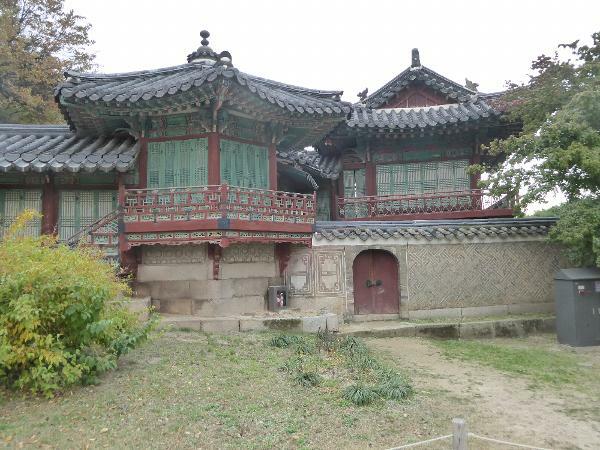 It's Seok-jo-jeon or Sokcho-jon, the "house made of stone," designed by G.R. Harding, an English architect from Hong Kong. Completed in 1909, it was used as an audience chamber. It must have been slightly disappointing for foreign ambassadors hoping for Oriental exoticism. 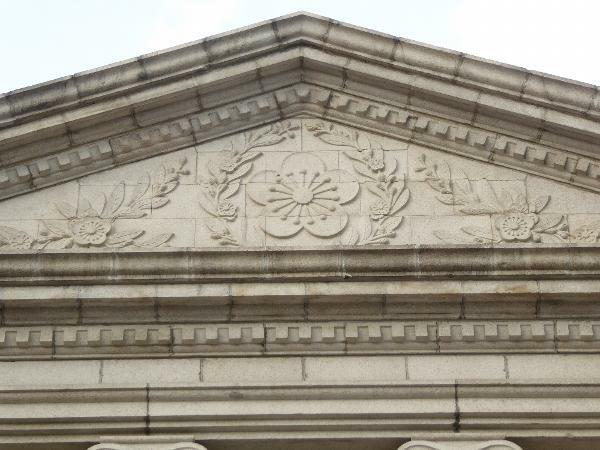 It has a few Korean touches, like this Ihwamun or plum-flower imperial seal, originally the seal of the Yi family, founder of the Joseon Dynasty. Ironically, the empire was nearly at its end when the building was finished. 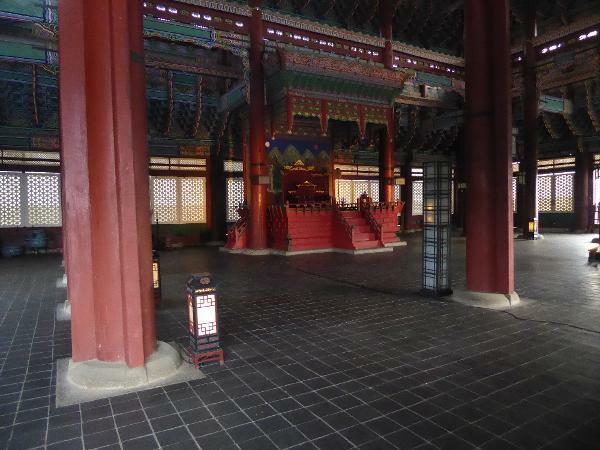 The abiding relics of the kings who ruled Korea from 1400 are here, at the Jongmyo Shrine. There's something about the central path that attracts people--and not just children: people just want to walk on it. Call it faded sacrilege, shocking to the few who remember that after three years of mourning in the palace, successors to the throne would carry the spirit table of the deceased king along this path to the resting place ahead. The right-hand path was for his successor; the left, for the heir apparent and officiants. Nomenclature? 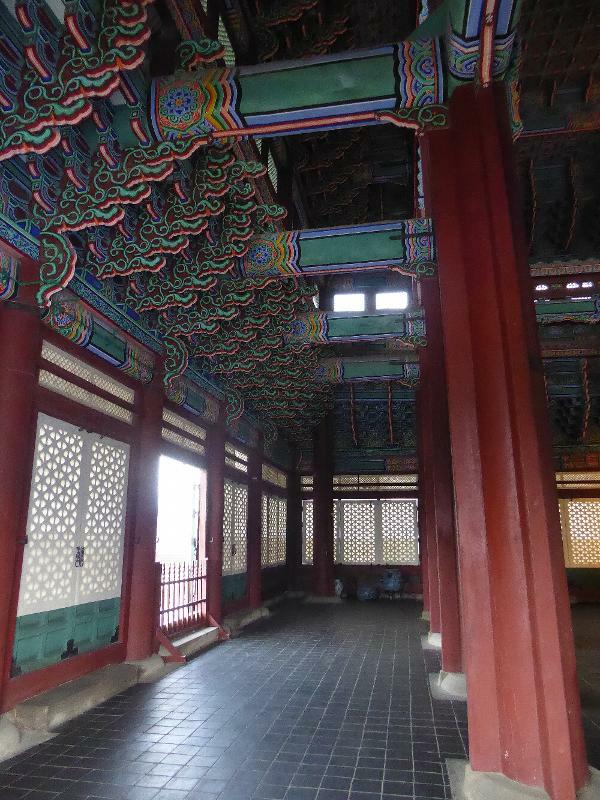 Call it the silla passageway; Sinhyang-ro at the center; Eo-ro on the right; Seja-ro on the left. There are two repositories. 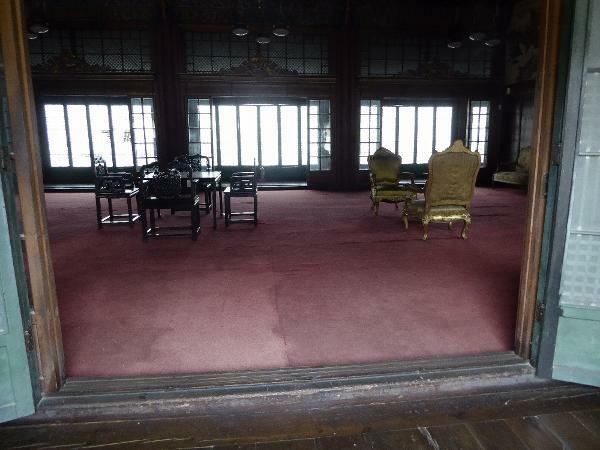 This is the Chong-jon or Main Hall, established in 1395 by King T'aejo. 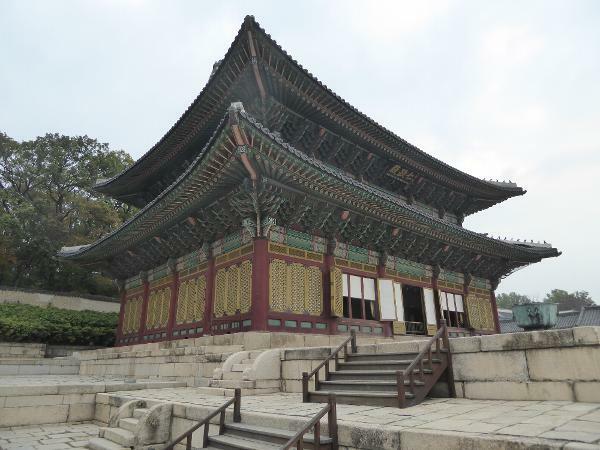 The Japanese burned it in 1608, but it was rebuilt and enlarged. The roof line is not quite horizontal but instead rises slightly at each end. Ceremonies were held five times a year until 1945; since then, there's been one annual event--since 1971 on the first Sunday in May. The rest of the year the doors are locked. Inside, inscribed tables rest in cabinets behind an altar. The ambience is austere, except for an inner band of woodwork suggestive of clouds. 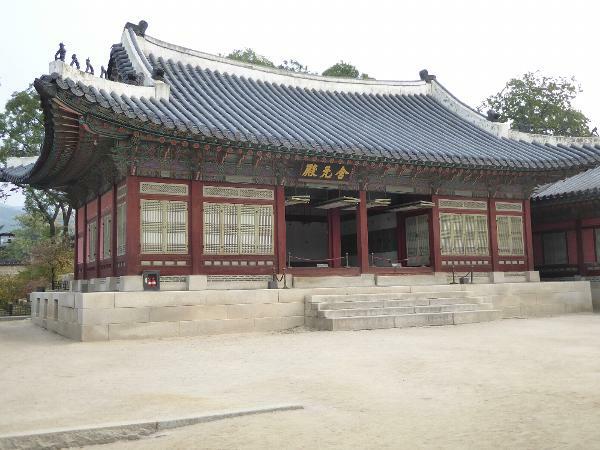 The Yongnyong-jon or Annex was built in 1421 but expanded with its side wings in 1608 and again in 1836 to hold 16 chambers and 34 tablets, including four generations preceding Taejo. Here's the gate to the plaza in front of the annex. It's quiet enough that even a committed rationalist might wonder for a moment if the spirits of the deceased were present.